A blob of 'Blu-Tak' at the base of its pin holds the pinned specimen in place on a glass sheet. The glass sheet is in turn held five centimetres above a photographic light box by upended glass tubes at its corners. 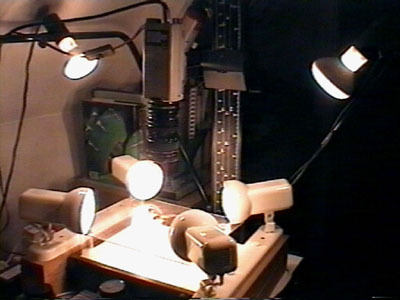 The two 60 Watt incandescent tungsten bulbs of a standard 'Lupo' photographic copying stand are supplemented by four side-mounted incandescent 60 Watt bulbs at mutual right angles, held in place by wooden blocks. Light is hence coming from all four sides as well as from 45 degrees above each side of the specimen. Any shadow comes to focus on the glass plate and is diffused by the time it reaches the photographic light box below. Any residual diffuse shadow is killed by the light coming upwards from the light box. Using this technique not only single specimens but quite large groupings of specimens can be photographed with elimination of shadows. The image can be captured onto emulsion by a standard camera (using an 80A blue filter to correct the colour balance for tungsten lights) or - as in this case - captured by a Video camera and taken straight into the computer by capture board. Lenses used are standard 35 mm SLR Nikon lenses mounted to the video camera by C-mount adapter. Extension tubes and/or use of a Tokina 28-70 mm macro-zoom lens enables specimens of a wide range of wingspans to be framed correctly.